Bright, fresh, and super-healthy this chopped grilled shrimp salad is the perfect summer entree. And the whole thing is made on the grill...yes, even the lettuce! It may sound crazy, but this step adds beautiful color, and unexpected flavor. It really elevates this simple dish. 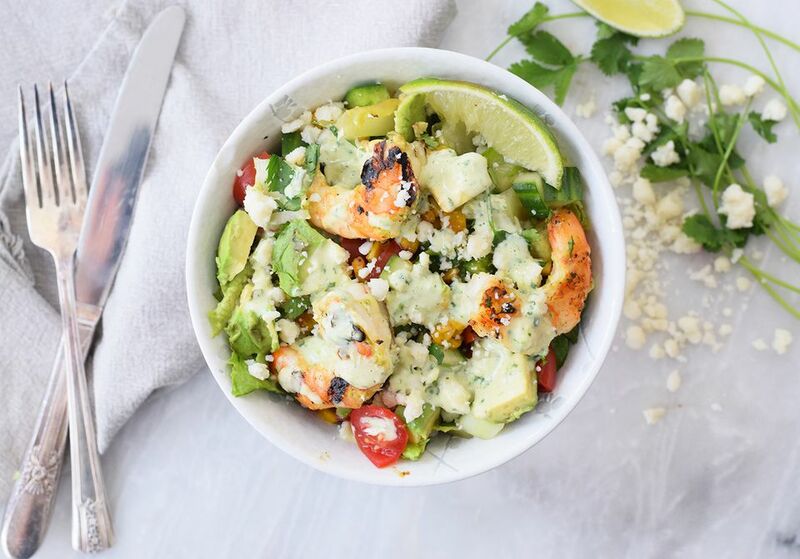 Succulent grilled shrimp, a super-simple avocado and lime dressing, and a crumble of cotija cheese round out this gorgeous salad. Cut the romaine hearts in half lengthwise. Brush them with olive oil and sprinkle with salt and pepper. Place the romaine hearts directly on the grill and quickly char them. You don't want the lettuce to be completely wilted, just a nice, quick char. Place them on a plate to cool. Gather your charred corn ingredients. If you are using corn on the cob, follow the directions in the variations section. Place the olive oil, salt, pepper, and corn in a sauce pan. Heat on high heat. Cook the corn until charred. Shake and toss the pan every few minutes so that both sides of each kernel are cooked. While the corn is cooking, make the dressing. Combine all of the dressing ingredients (except the olive oil) in a blender or food processor and blend until completely smooth. Drizzle in the olive oil as you are blending. Add more water if the dressing is too thick. Place the peeled shrimp onto skewers. Use a few tablespoons of the dressing to brush over both sides of the shrimp. Add them to the grill and grill for a few minutes on both sides, or until cooked through. Brush with more dressing as you are grilling. Just make sure to keep that portion of dressing separate so you don't cross-contaminate the salad. Add the romaine and the other chopped vegetables, including the corn, to a bowl. Add 1/4 cup of the dressing and toss together until the salad is lightly dressed. Divide the salad among four bowls, and top each salad with the shrimp, cotija cheese, avocado, and an extra drizzle of dressing. Serve immediately, and enjoy! Brush the ears of corn with olive oil and sprinkle with salt and pepper. Wrap them in aluminum foil. Place the ears of corn on the grill and cook for 10 minutes or until steamed through. Remove them from the foil and place them on the grill to get a nice char. Remove the kernels from the ears of corn and set them aside.